In the second month of Nicaragua’s bloody political crisis, masked anti-government protesters have set up more road blocks and barricades across the country. Police and paramilitary groups allegedly linked to the government continue to attack perceived enemies of the regime. And on Monday, Catholic leaders in Nicaragua announced that they were again suspending talks with the government. After the failure of the latest attempt by the church to establish a dialogue, President Daniel Ortega seems more isolated than ever, and there is not even a short-term solution to the violence in sight. According to the Episcopal Conference of Nicaragua, Mr. Ortega failed to honor an agreement that he would invite the European Union and the United Nations High Commissioner for Human Rights to monitor the situation in the small Central American nation. It was the second time the church walked away from the negotiating table; a previous attempt to negotiate with the government was suspended on May 23. Mr. Ortega failed to honor an agreement that he would invite the European Union and the United Nations High Commissioner for Human Rights to monitor the situation. The suspension is yet another setback in a political crisis that continues to deepen. According to the Nicaraguan Center for Human Rights, more than 160 people have been killed since Nicaraguans first took the streets in April to to demonstrate against proposed social security reforms. A violent crackdown on protesters by law enforcement—and by gangs observers say are linked to the government—has escalated the demonstrations into nationwide protests against what many Nicaraguans say is an increasingly authoritarian Ortega regime, even after the government canceled the controversial reforms. Critics like Ms. Lacayo say that Mr. Ortega has turned Nicaragua in a would-be dictatorship since an election victory in 2007 restored him to power. He had previously led the Sandinistas’ revolutionary junta, and he had served a first term as president between 1985 and 1990. 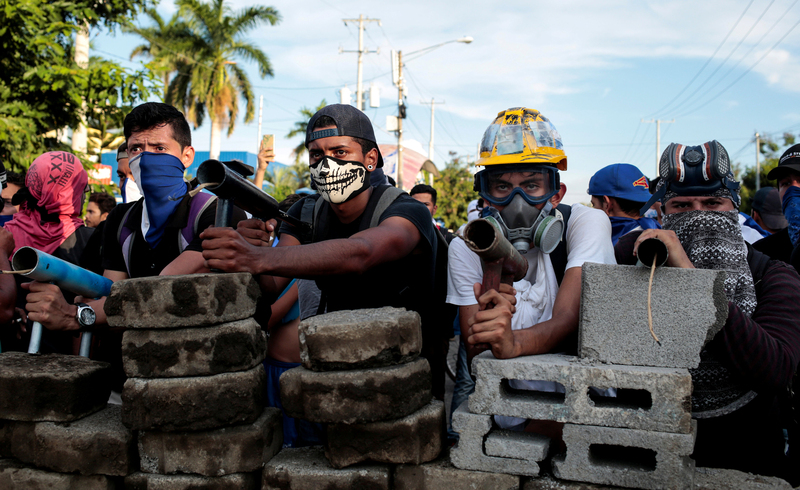 A violent crackdown on protesters has escalated the demonstrations into nationwide protests against what many Nicaraguans say is an increasingly authoritarian Ortega regime. Over the past decade, critics say that Mr. Ortega has manipulated elections, co-opted the Supreme Court and banished opposition lawmakers from Congress. Mr. Ortega has eliminated presidential term limits and named his wife, Rosario Murillo, as vice president. It is widely believed that he expects his wife to succeed him in the next presidential election, scheduled in 2021, which few critics expect will be fair. Over the past two months, Mr. Ortega’s soft authoritarianism has turned into violent repression. According to the opposition newspaper Confidencial, law enforcement and members of an alleged government-sponsored paramilitary group set fire to a home in Managua on Sunday in retaliation for a family’s refusal to allow its third floor to be used by government snipers. Five members of the family died in the fire. In early June, one city after another was hit by strikes and fighting between protesters and supporters of the governing Sandinista party. The protesters’ main tactic has been to close down roads, aiming to strangle the economy and force Mr. Ortega to make concessions. The western city of León, Nicaragua’s second-biggest, has been most affected, with an estimated 400 barricades across the city. The protesters’ main tactic has been to close down roads, aiming to strangle the economy and force Mr. Ortega to make concessions. “It was extraordinary how quickly the roadblocks were built,” Father Aberlado Tobal, a priest in the parish of Sutiaba, told the Catholic News Service. He said that after a video showed armed government soldiers driving through the city, “all over town, local people began to rip up the paving stones and build barricades.” Within half a day there were more than 100 barricades just in the Sutiaba neighborhood. Father Tobal said he has had to mediate local conflicts where Catholic laypeople are caught up on opposite sides of the battle. “Daniel Ortega should listen to the clamor of the people,” he said. “The situation needs to be resolved soon or the winners will be common delinquents.” He said his greatest fear is a slide toward generalized crime and violence. Before April, Nicaragua was considered the safest country in Central America. “My parishioners are calling for the law of God to be respected, that lives are spared. But we also see supposed Catholics on the side of violence. I believe they are not Catholics in truth, they”re Catholics in name alone,” he said. Despite the violence, opposition to the government has only intensified. Last Thursday, a general strike emptied streets across the country. It was largely supported by the private sector, a former reluctant ally of the regime. On Monday, a coalition of activists called for protesters to expand the road blocks. Mr. Ortega, and his wife and vice president Rosario Murillo, seem increasingly isolated, but they show few signs of backing down. Many observers believe the president’s position has become unsustainable, but few see a quick exit from the crisis. Ms. Belli says she has little faith in the president’s ability to reach an agreement with the opposition, citing his stubborn nature. She has known Mr. Ortega and Ms. Murillo for many years; in the early 1970s, she joined the Ortega-led Sandinista Front for National Liberation, which ousted the dictator Anastasio Somoza in the Nicaraguan Revolution of 1979. Over the years, however, she became disillusioned with Mr. Ortega and is now one of the regime’s fiercest critics. “He was always irritable, a man of few words, a complex character,” she told America. “He tends to only listen to what he wants to hear, and he never speaks to anyone. When he leaves his home, he does so with a huge security detail. Many Nicaraguans believe foreign pressure might be key to convincing Mr. Ortega and Ms. Murillo to back away from more violence and seek a peaceful resolution to the crisis, but the international response has been slight so far. “There are few countries in the region that appear to be able to exert pressure on Nicaragua,” said Mike Allison, a political scientist and expert on Central America at the University of Scranton. Additional reporting from Catholic News Service. Another socialist paradise brings problems. When will they ever learn? About Camilo Mejia: he was the first G.I. to refuse redeployment to Iraq/Afghanastan. He did prison time for refusing to torture prisoners. He is the son of famous Nicaraguan singer/musician Carlos Mejia Godoy https://genius.com/albums/Carlos-mejia-godoy/Misa-campesina-nicaraguense Camilo is the author of Road from Ar Ramadi which explains why he became a conscientious objector while serving in the U.S. military. Please check out Camilo Mejia's analysis on The Real News and Max Blumenthal on Truthdig you will find a larger perspective on both. I joined a Witness for Peace delegation that traveled to Nicaragua in April of 1984 to see the workings of the Sandinistas and the interference from the Contras who were working to overthrow the government. Ortega was seen then as a hopeful figure, one who surrounded himself with intellectuals and progressives, including Ernesto Cardenal, a Catholic priest. At the time I was most impressed with the work being done by the Maryknoll Sisters in Ocotal, a town famous or infamous in our history of interfering in the region. The town and its people suffered bombing attacks from American Marines backed by the Nicaraguan National Guard which were directed at the Sandinista rebels. Not long after my visit, I certainly became less hopeful that Ortega would provide meaningful change as he appeared more interested in filling his own needs and not those of his country men and women. Now he more resembles the leaders of El Salvador or the Philippines than he does a rebel leader committed to freeing his people from the economic oppression that binds them. The solution will not come at his hands, nor those of his wife. It will require the patient determination of the Church and her followers and leaders to transform this country once again. I can still recall the image of a pile of machine guns and other weapons sitting outside the Catholic Church on Sunday as we went in to attend Mass. They belonged to the young members of the military, some just 15 years old. They have grown up and lived with turmoil all their lives. And Ms Belli is correct, war serves Ortega's interests. The region and the country deserve so much more, and it will require a Romero like devotion to bring about meaningful change. This article also appeared in print, under the headline "In Nicaragua, a crisis deepens as church intervention falters," in the July 9, 2018 issue. Jan-Albert Hootsen is America’s Mexico City correspondent.